Named ranges are one of these crusty old features in Excel that few users understand. New users may find them weird and scary, and even old hands may avoid them because they seem pointless and complex. But named ranges are actually a pretty cool feature. They can make formulas *a lot* easier to create, read, and maintain. And as a bonus, they make formulas easier to reuse (more portable). Like named ranges? Hate named ranges? Leave your thoughts below. What is a named range? To quickly test the new range, choose the new name in the dropdown next to the name box. Excel will select the range on the worksheet. You can also use the keyboard shortcut control + shift + F3. Once you create a named range, use the Name Manager (Control + F3) to update as needed. Select the name you want to work with, then change the reference directly (i.e. edit "refers to"), or click the button at right and select a new range. There's no need to click the Edit button to update a reference. When you click Close, the range name will be updated. Note: if you select an entire named range on a worksheet, you can drag to a new location and the reference will be updated automatically. However, I don't know a way to adjust range references by clicking and dragging directly on the worksheet. If you know a way to do this, chime in below! To quickly see all named ranges in a workbook, use the dropdown menu next to the name box. Note: on a Mac, there is no Name Manager, so you'll see the Define Name dialog instead. Thanks for this tip, Felipe! Names can't contain spaces and most punctuation characters. Names can't conflict with cell references – you can't name a range "A1" or "Z100". Single letters are OK for names ("a", "b", "c", etc. ), but the letters "r" and "c" are reserved. Names are not case-sensitive – "home", "HOME", and "HoMe" are all the same to Excel. For example, lets say you name a cell in your workbook "updated". The idea is you can put the current date in the cell (Ctrl + ;) and refer to the date elsewhere in the workbook. You can paste this formula anywhere in the workbook and it will display correctly. Whenever you change the date in "updated", the message will update wherever the formula is used. See this page for more examples. Once you've created a named range, it will appear automatically in formulas when you type the first letter of the name. Press the tab key to enter the name when you have a match and want Excel to enter the name. Then you can use these names anywhere you like in formulas, and update their value in one central location. The reference to D2 is absolute (locked) so the formula can be copied down without D2 changing. 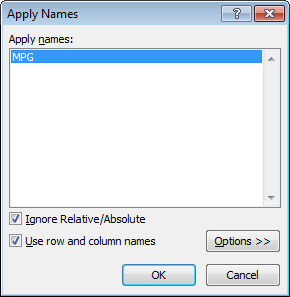 Since MPG is absolute by default, the formula can be copied down column D as-is. Although named ranges are absolute by default, they can also be relative. A relative named range refers to a range that is relative to the position of the active cell at the time the range is created. As a result, relative named ranges are useful building generic formulas that work wherever they are moved. CellAbove will now retrieve the value from the cell above wherever it is it used. Important: make sure the active cell is at the correct location before creating the name. If you have existing formulas that don't use named ranges, you can ask Excel to apply the named ranges in the formulas for you. Start by selecting the cells that contain formulas you want to update. Then run Formulas > Define Names > Apply Names. Excel will then replace references that have a corresponding named range with the name itself. Important: Save a backup of your worksheet, and select just the cells you want to change before using find and replace on formulas. At a glance, you can see the only difference in these formulas in the column index. Named ranges can make it much easier to reuse a formula in a different worksheet. If you define names ahead of time in a worksheet, you can paste in a formula that uses these names and it will "just work". This is a great way to quickly get a formula working. To quickly "port" this formula to your own worksheet, name a range "data" and paste the formula into the worksheet. As long as "data" contains numeric values, the formula will work straightway. Tip: I recommend that you create the needed range names *first* in the destination workbook, then copy in the formula as text only (i.e. don't copy the cell that contains the formula in another worksheet, just copy the text of the formula). 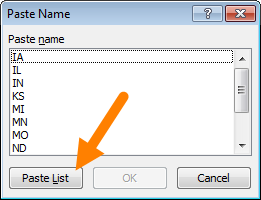 This stops Excel from creating names on-the-fly and lets you to fully control the name creation process. To copy only formula text, copy text from the formula bar, or copy via another application (i.e. browser, text editor, etc.). Named ranges are great for quick navigation. Just select the dropdown menu next to the name box, and choose a name. When you release the mouse, the range will be selected. When a named range exists on another sheet, you'll be taken to that sheet automatically. Named ranges make hyperlinks easy. For example, if you name A1 in Sheet1 "home", you can create a hyperlink somewhere else that takes you back there. Note: oddly, you can't hyperlink to a table like you can a normal range name. However, you can define a name equal to a table (i.e. =Table1) and hyperlink to that. If anyone knows a way to link directly a table, chime in! Names ranges are extremely useful when they automatically adjust to new data in a worksheet. A range set up this way is is referred to as a "dynamic named range". There are two ways to make a range dynamic: formulas and tables. When you create an Excel Table, a name is automatically created (e.g. Table1), but you can rename the table as you like. Once you have created a table, it will expand automatically when data is added. Note: If you have formulas that refer to named ranges, you may want to update the formulas first before removing names. Otherwise, you'll see #NAME? errors in formulas that still refer to deleted names. Always save your worksheet before removing named ranges in case you have have problems and need to revert to the original. To remove named ranges from a workbook manually, open the name manager, select a range, and click the Delete button. If you want to remove more than one name at the same time, you can Shift + Click or Ctrl + Click to select multiple names, then delete in one step. Then shift+click to select all names and delete. Named ranges in Excel have something called "scope", which determines whether a named range is local to a given worksheet, or global across the entire workbook. Global names have a scope of "workbook", and local names have a scope equal to the sheet name they exist on. For example, the scope for a local name might be "Sheet2". Named ranges with a global scope are useful when you want all sheets in a workbook to have access to certain data, variables, or constants. For example, you might use a global named range a tax rate assumption used in several several worksheets. Local scope means a name is works only on the sheet it was created on. This means you can have multiple worksheets in the same workbook that all use the same name. For example, perhaps you have a workbook with monthly tracking sheets (one per month) that use named ranges with the same name, all scoped locally. This might allow you to reuse the same formulas in different sheets. The local scope allows the names in each sheet to work correctly without colliding with names in the other sheets. Global scope means a name will work anywhere in a workbook. 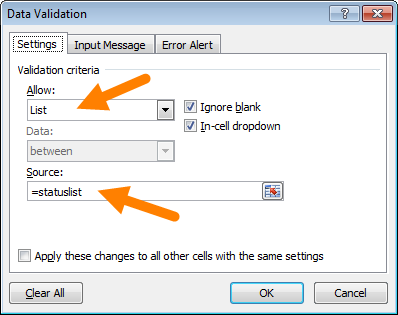 For example, you could name a cell "last_update", enter a date in the cell. Then you can use the formula below to display the date last updated in any worksheet. Global names must be unique within a workbook. Locally scoped named ranges make sense for worksheets that use named ranges for local assumptions only. For example, perhaps you have a workbook with monthly tracking sheets (one per month) that use named ranges with the same name, all scoped locally. The local scope allows the names in each sheet to work correctly without colliding with names in the other sheets. By default, new names created with the namebox are global, and you can't edit the scope of a named range after it's created. However, as a workaround, you can delete and recreate a name with the desired scope. If you want to change several names at once from global to local, sometimes it makes sense to copy the sheet that contains the names. When you duplicate a worksheet that contains named ranges, Excel copies the named ranges to the second sheet, changing the scope to local at the same time. After you have the second sheet with locally scoped names, you can optionally delete the first sheet. Jan Karel Pieterse and Charles Williams have developed a utility called the Name Manager that provides many useful operations for named ranges. You can download the Name Manager utility here.